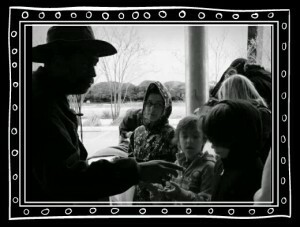 Volunteers are always welcome, and bring the kids! Our giveaway line opens promptly at 9:00 am. Please show up at 8:40 am for brief announcements and to help set up. If it’s your first time, click here to read a short PDF document about joining us. When you arrive at the giveaway site, please look for anyone wearing a yellow bandana; that means the volunteer is a Section Leader who can point you in the right direction. 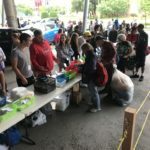 Our volunteers perform several tasks, including setting up tables, putting out item bins, managing the clothing area, handing out snacks and drinks, working behind the distribution line and breaking everything down. It all takes less than an hour. 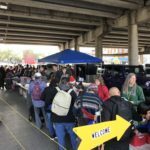 Several volunteers usually go to Central Market North Lamar for brunch immediately after the giveaway (weather permitting). Have you volunteered to pick up and sort donations? Awesome! 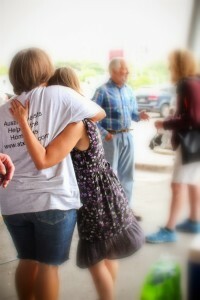 You can find the ATXHAW Donation Log Form and accompanying instructions by clicking the links. Do kids come to the giveaways? 1. Is your child physically able to help with the set up/break down of our giveaway items? It’s not a deal breaker if she can’t. If she can, we have small boxes filled with toiletries. They’re the perfect size for little hands to easily carry to the tables. We also have larger boxes and bags of clothing that can be carried by older children. An important side note for parents of very young children: There are no restrooms on site so it’s important for young ones to “take care of business” before leaving the house. 2. Have you discussed homelessness with your child? Depending on your child’s age and exposure to the community, he may be surprised by some of the things heard on the streets. While the vast majority of the people we help are polite and gracious, occasionally someone will use foul language (not directed at volunteers but just during conversation). Additionally, it’s important to prepare him for what he may see: people in various states of hygiene, some carrying bags and boxes of belongings, others with babes in their arms and kids his age by their sides…all these sights are a possibility at the giveaways. There are terrific resources available to parents. Try the Institute for Children, Poverty & Homelessness and Texas Homeless Education Office for starters. 3. Have you, as a parent, thought about your perspectives on homelessness and philanthropy? Do you have the resources and/or support system necessary to address any questions your child may ask? Click here for a great list of books and websites about secular humanism, homelessness, raising freethinking children, philanthropy, diversity and so much more. 4. If you’re unsure, please join us for a giveaway without your child. This will allow you to freely size up the environment and talk with some of the adult volunteers before deciding if it’s a good fit for your family. If you don’t think your child is ready to attend a giveaway, she can still be part of the process. Enlist her help to collect and sort donations, encourage her to set up an old fashioned lemonade stand then purchase items with the money raised…these are small ways to still contribute to our efforts without being present at a giveaway. Don’t hesitate to contact us if you have any questions or suggestions. Many of our volunteers are parents, too! Does your organization sign off on service hours for scouts or school clubs? We sure do! We’ll gladly offer ideas and sign off on their hours. 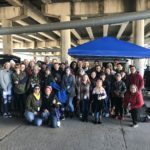 Kids from all over Austin and surrounding communities have volunteered countless hours volunteering with our organization. 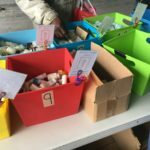 Kids have participated in activities like; making First Aid Kits, clothing drives, donated Girl Scout cookies, crocheted or knitted washcloths, hats and scarves for out Gettin’ Knotty Guild and so much more. Contact us with any questions or ideas you kids have.